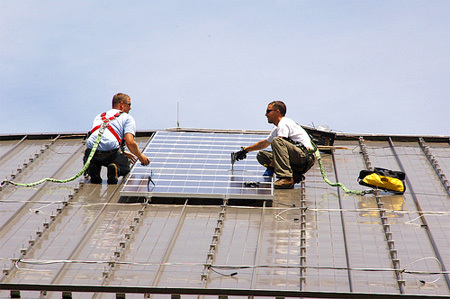 The average payback time for a standard-sized solar energy system (5kW) is about 7 years. Energy rates in the Boston metro area are higher than the national average at 15.2 cents/kWh. If you installed a 5kW system you would save approx. $889 per year on your electricity bill ($74/month). The state-wide solar rebate package in Massachusetts is run through the Commonwealth Solar Rebate Program (CSRP). The rebate can be quite complicated to calculate as multiple factors (income, property value, if locally purchased) are taken into consideration. Although, in general rebates are paid on solar systems up to 5kW with an incentive ranging in price from $2000 to $4250. Besides the state-wide solar rebate, the city of Boston also offers a further rebate for local residents signing-up to solar energy. A solar system installed in the Boston area will result in a cash refund up to a maximum of $2800, which is calculated at 1/3 or the amount offer by the state-wide rebate. In most US states there is either a rebate package or tax credit, though that isn’t the case in Massachusetts, as you benefit from both. A state-wide tax credit is 15% off the solar energy system, which is calculated up to a maximum of $1000. The Renewable Portfolio Standard (RPS) for the state of Massachusetts issued a mandate to source at least 15% of its energy from renewable sources by the year 2020, which will increase by 1% for each year thereafter – with no finishing date set. Also, the state legislator is targeting an ambitious figure of 400MW of solar power by 2020; with this figure currently standing at 22MW, being able to achieve this mandated figure might well be on the improbable side. In the state of Massachusetts a net-metering system, which means customers are able to receive a credit for any surplus energy generated, is in place which varies in value dependent on the size of a solar system. Across the state the utility companies offer several different tiered programs, which can range from the ideal 1 kilowatt for 1 kilowatt credit to some less generous packages, such as .9 kilowatt-hour given for each 1 kilowatt-hour generated. Net-metering is limited to 1% of an energy companies capacity, which is nowhere close at the present time, even so that can soon change as more people sign up to solar energy.